This is a piece of poetry about Wordsworth’s childhood. 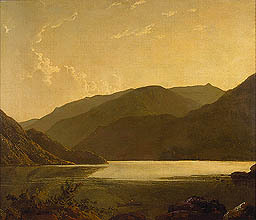 In the extract the young Wordsworth takes a boat, without permission, for a row on Ullswater at night. His feelings of guilt summon up a vision of the mountain opposite looming out of the darkness as if to punish him. Although Wordsworth quickly returns the boat, he is haunted for many nights by the memory. The extract comes from Wordsworth’s autobiographical poem The Prelude. There are many manuscripts of the poem and this lesson concentrates on investigating three of them: the earliest (1799), the earliest complete version of the whole 13 Book poem (1805) and the first published version after the poet's death in 14 Books (1850). The earliest version in manuscript is held in MS JJ. Set the scene by explaining a little bit about The Prelude and the extract they will be looking at. Split the class into 4 smaller groups. Each group receives a different coloured segment of the poem, with the three versions on it. 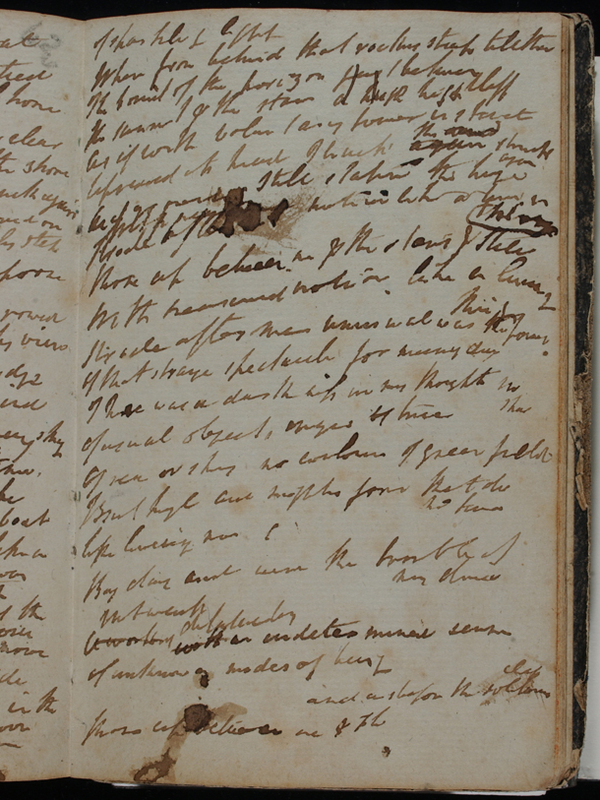 Find places where Wordsworth has made changes to the text. Why do you think Wordsworth made changes? Do you think they are successful? Which of the three versions do you prefer, and why? Are there any images that you think are particularly powerful? Try and say why you think this is. Is it to do with the visual description of the words, the feelings of the boy, or the sound of the words? Do you think anything is unsuccessful? Can you find any literary techniques Wordsworth has used? Think about use of simile (a comparison using "like" or "as"); metaphor (a description of one thing as if it were another); repetition; and other effects. Does the mood or tone change in the course of the segment? If so, how? Does the mood or tone change between versions? If so, how? Give out sheets with all the segments on them to compare and read a single version of any one of the texts. Ask each group to report back on what they have discovered. Use their comments to stimulate general discussion. You could read the 1799 version from each segment before you get feedback, or get a volunteer from each group to do so. Sum up the themes: nature, imagination, childhood. Identify and anticipate images used. Finally, look at the manuscript of the poem. 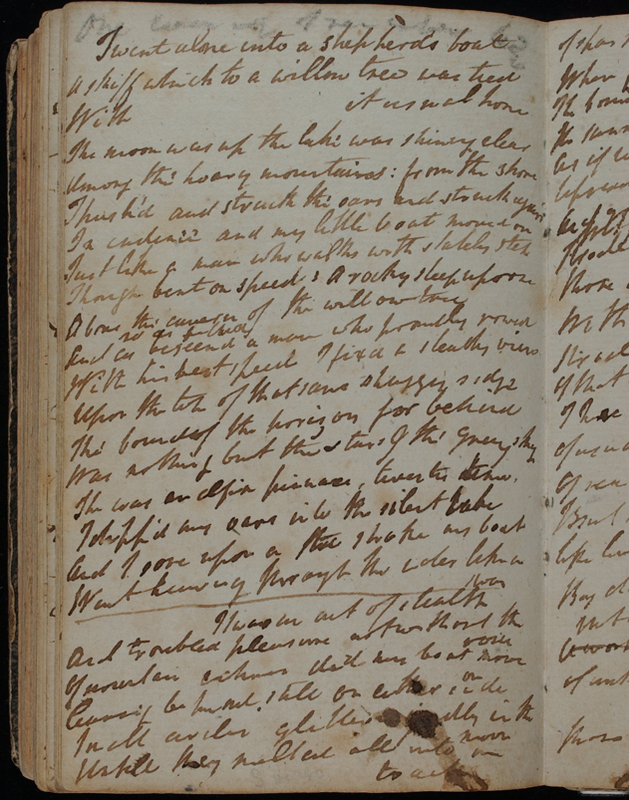 This manuscript is a letter in the hand of Dorothy Wordsworth (the poet’s sister), written from the German town of Goslar where William and Dorothy spent the winter of 1798/9. It was written to their friend and fellow poet Samuel Taylor Coleridge and contains the first versions of several extracts that became part of The Prelude, including boat stealing. See if the class can find and read the extract, and the little bit of prose that Dorothy writes above it. A. From The "Two-Part" Prelude , 1798-99; Cornell Reading Text, 81-129. B. From The "Thirteen-Book"Prelude ", Cornell Reading Text, Book 1, 373-428. C. From the "Fourteen-Book" Prelude: Cornell Reading Text, Book 1, 357-400. A Schoolboy Traveller at the Holidays. Than I unloos'd her tether and embark'd. Was nothing -- but the stars and the grey sky.